Scotland has a proud tradition of great work in STEM fields. With Scientists from Jocelyn Bell Burnell and Victoria Drummond to Elaine Bullard and Marion Cameron Gray having studied or worked here at some point in their scientific careers. This tradition continues today with Scotland boasting 5 of the world’s top 200 universities and with more research professionals per capita in Scotland than in the rest of the UK. With such a buzz of exciting research going on we thought it was high time to show it off. 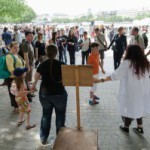 What better way than with Science Soapbox? Keen to beat Edinburgh to it, our organisers (that is, Mhairi Stewart (@ScienceArtReach), Paul Hoskisson (@PaulHoskisson) and myself) met with Hilary Lappin-Scott, a microbiologist based in Swansea who took part in Soapbox London in 2013, to hear about how it all works. Encouraged by Hilary, we were soon gathering a small team, investigating possible interested speakers and discussing plans with the Glasgow Science Festival team to find out how we could make this work best. Our team have spent a good bit of time working on other outreach events and we also run the Glasgow chapter of ScienceGRRL so Soapbox seemed a natural extension of the work we already do. We think this is an important opportunity to raise the profile of women working in science and to show the public that scientists aren’t exclusively bearded boffins in labcoats but that they are real people with personalities as varied as their backgrounds and research interests. We have high hopes that our selection of speakers will reflect this. So far we expect talks on subjects as varied as malaria parasites and wobbles in space with everything in between. We haven’t closed applications for speakers yet, though, so do get in touch if you’re based in Scotland and feel like waving your arms about and shouting about science. The more the merrier. Because of this it’s important to us that we really focus on delivering a good range of talks. We want speakers from all disciplines and at all stages in their careers. We want to show off all of the wonderful research that Scotland is working on and, by doing so, to encourage young people to consider science as a possible career. We want to start debate and to engage with members of the public who don’t normally get to hear about science and research. We hope they’ll be as fascinated as we are by what’s going on.